Hugh Response to Maestro “IlayaRaja” concert in Bay Area on March 1st.. 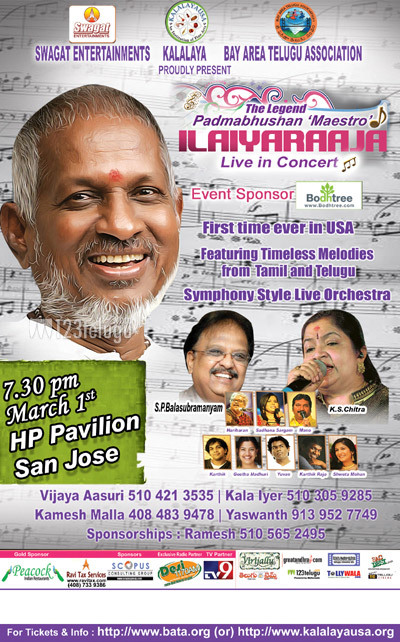 The response has been overwhelming for the much awaited IlayaRaja concert in Bay Area. It is on March 1st (Friday) at HP Pavilion from 7:30 pm onwards. First time ever in USA. Symphony style orchestar with 70+ musicians. Singers Include: PadmaBhushan S.P. BalaSubrahmanyam, Padmasri K.S. Chitra, Hari Haran, Sadhana Sargam, Mano, Kartik, Geeta Madhuri, Kartik Raja, Yuvan Shankar Raja & Sweta Mohan. This event is presented by Swagat Entertainments, Kalalaya & Bay Area Telugu Association (BATA). 2. VIP & VVIP tickets (Floor Level) can be bought from Swagat Entertainments Office @ Milpitas.